Back at the start of October, our team was joined by Thomas and Reuben; new recruits fresh out of our Footprint Academy. Our rookies were out of boot camp and heading towards the frontlines of digital marketing, with the full support of the seasoned foot soldiers that make up the rest of our agency. Now, one month on, they are as much a feature in the office as the plants (that we really should water more often). With a fair amount of inevitability, week one began with HR, health and safety, and admin (lots of admin). Before long, however, they were into the job and feeling good. Thomas was soon on the road to visit clients with some of the team, whilst Reuben enjoyed welcoming others into the office. Overall, the first week went really well. The second week was more of the same, as Reuben and Thomas continued to learn their roles, and the responsibilities that came along with them. On Friday, the new relationship managers gave presentations on the technical state of two client websites, giving them a chance to flex their analytical muscles. We were also visited by Liz Flavell, a business performance coach who gave a very interesting talk. We were both starting to see the gains we were making. For our third week, the team decided they wanted to find out more about us. They set a task to achieve this – making a presentation about ourselves, our strengths, and our weaknesses. We spent a lot of the week feeling our way through the technical tools and digital marketing systems, getting a bit more acquainted with them outside of the training sessions, and we were starting to get our feet under the table. Bruce from Mackman was our guest speaker on Friday, talking to us about mapping the customer journey. The office was starting to feel a lot more familiar for the both of us. Week four saw the Apprentice Challenge, our first as full team members, and we were back to familiar territory at the University of Essex. In the office, we were starting to get more involved with clients, carrying out analysis, and reviewing user testing videos. A shorter week meant a lot going on, so it was all hands on deck to make sure everything that needed to be done got finished. 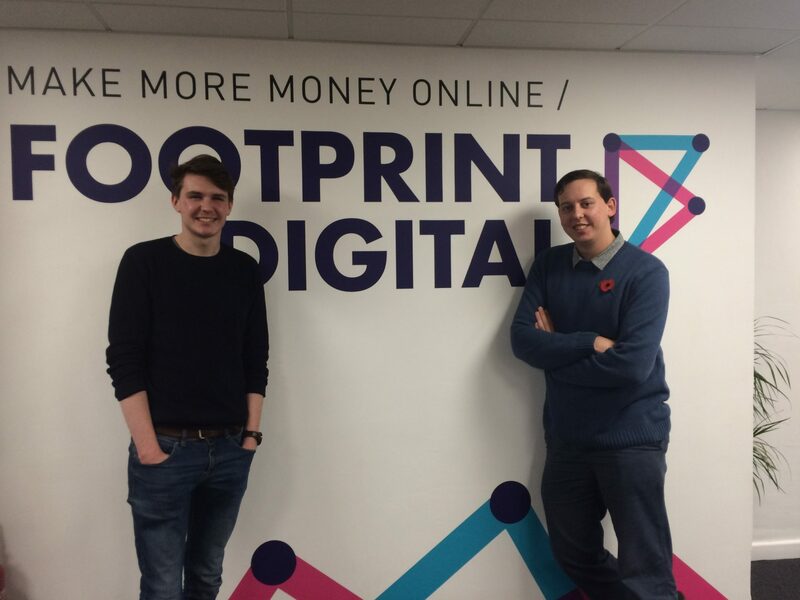 We were quickly learning that the average day at Footprint Digital was anything but average. Both of us really started to feel like Relationship Managers in week five, as we were planning, building, and running strategy sessions for new clients that had recently joined us. Everything had been building towards this kind of activity, but we had a lot of encouragement from our amazing team. With more client interaction and a calendar that was starting to get a fair bit busier, we were beginning to get the idea of what we would be doing on a daily basis from here on in. We’re finding it hard to believe that we’ve been here for five weeks already. The time has flown by, yet it is also starting to feel very familiar now. It’s amazing to see the growth we have both made since we started, but there’s a lot more to come. With a wonderful team around us to support us, things are looking really great. It’s an exciting time, and not just because the Christmas lights will be going up soon. We’re very happy to be here – and hopefully the team are pleased we are here too!